Proving conclusively that no one listens to videogame critics, Aliens: Colonial Marines has sold 1.31 million copies since its February debut. Sega just revealed its most recent financial report and the company is doing relatively well. Profit is up nearly 54 percent, thanks in particular to two very different, but very popular videogames: Sonic And All-Stars Racing Transformed and the objectively terrible Aliens: Colonial Marines. 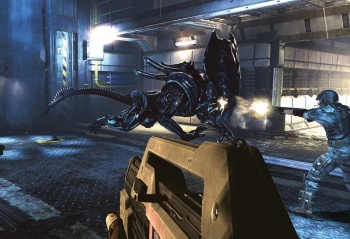 The former we understand, as Transformed is a legitimately fun kart racer in the vein of Mario Kart, but Aliens: Colonial Marines remains the current go-to example of wasted potential (not to mention developer duplicity, poor level design, subpar aesthetics, poor quality assurance ... I could go on and on, but there's little to insult about Aliens: Colonial Marines that hasn't already been jabbed by a hundred other critics). Actually, Aliens: Colonial Marines was such a debacle that TimeGate, one of the two studios responsible for the title's development, was shuttered yesterday. Gearbox Software, the game's other developer, remains in business, largely thanks to the massive sales of Borderlands 2. However, it is not without its detractors as well. In April Polygon discovered a class action lawsuit filed in California which claims that the game was falsely advertised to consumers - specifically that everyone behind the game lied as often as possible to distract from the depressing quality of what they were working on. To recap: Aliens: Colonial Marines may be the most universally despised game since Duke Nukem Forever - sadly also a Gearbox project -Â and caused the collapse of at least one game studio. It's undeniably a bad game, and yet 1.31 million of you decided to drop $60 on the title.